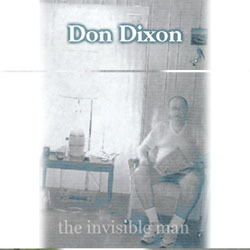 Don Dixon "The Invisible Man"
It's going to be a little less dull out there now that Don Dixon's back. The quirky singer/songwriter starts out the new decade with a bang by releasing his first album in five years, "The Invisible Man." The 11-cut masterpiece is a thematic song-cycle tracing a man's life through songs reflecting his outlook at different ages, ranging from 18 to 83. Known to as many for his production credits as for his own releases, Dixon has been cited for his behind-the-scenes work on dozens of project, including albums by R.E.M., The Smithereens, Marshall Crenshaw, and wife Marti Jones. Dixon started out as a bass player/vocalist for the Chapel Hill, NC-based group Arrogance, which released five albums over almost a decade, including the major label (Warner Bros.) release Suddenly. His debut solo album, Most Of The Girls Like To Dance But Only Some Of the Boys Like To, established Dixon as more than just an American rock cult figure. It reflected a rather wry appraisal of life and love and was a critical favorite right out of the box. And the success of the album's hit single, "Praying Mantis," gave Dixon the credibility as an artist that he had already established as a producer. Romeo At Juilliard, displayed more of Dixon's wit and charisma. Anthony DeCurtis of Rolling Stone characterized the album as representing "significant growth," and that Dixon "brings barrel-chested R & B gusto" to the album's 11 tracks. Dixon's third solo effort EEE, contained a healthy dollop of his instinctive insight into the human condition as he took on perpetual man/woman questions in "Silent Screen," as well as more cosmic ruminations in "Roots Of Truth." Romantic Depressive (1995), garnered wonderful reviews and AAA airplay, prompting him to tour as the support act on a series of amphitheater dates for Hootie & The Blowfish. As a songwriter, Dixon landed a single on the last Joe Cocker million-seller with "I Can Hear The River" and a co-write of the song "Time and Time Again" with the Counting Crows. And while writing, Dixon also has been playing. He played bass on Mary Chapin Carpenter's #1 single "Shut Up And Kiss Me."